"At first I was wary of the idea because it sounded kind of gross! But never one to judge a book by its cover or to shy away from giving a recipe or an idea a try, I decided to whip up a batch of my own. 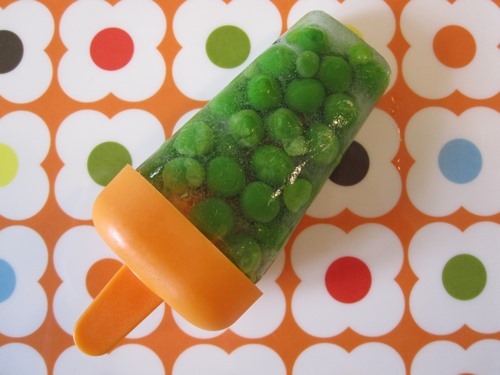 I wasn't exactly sure the kids would react when they first saw green peas in popsicle form, and I didn't have huge expectations. So much for expectations — they loved them. I guess the mere idea of peas on a stick were hilarious to them because they were fascinated. It just goes to show that you can't impose your own thoughts on what you think your kids will and won't like." Try it if you dare. And then report back, please. I'm pretty sure this is just going to taste bland but kind of bitter and also kind of awkward. I'll pass. I'd rather use those popiscles like I used to as a kid: fill 'em up with minute maid juice! :D The orange pops were my favorites! Looks awesome but I don't know that it would taste awesome.